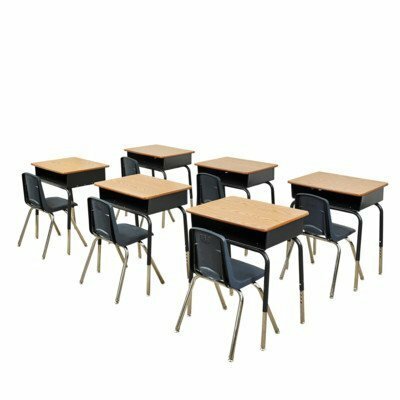 A classic and versatile desk perfect for any classroom! Desk is generously sized to provide a comfortable workspace, and metal storage box has plenty of room for books, journals, pencil cases, and more. An indented pencil groove holds writing utensils in place and keeps clutter off the work surface. Desk features an easy-to-clean top and four nylon swivel glides, one of which is adjustable to balance out any floor unevenness. Also includes 6 chairs.